36 (21 August 1981), FIFA-listed 2012. Assistant Referees - Danny Krasikow, 44 (5 February 1973), and Roy Hassan, 36/37 (1982). ELO rating 106th Colours: Made by Hummel - Yellow v-necked jerseys with black shoulder panels/collar, black/white Hummel zip tim down side, pale green shorts with white/black Hummel zip trim, yellow socks with green trim/double Hummel trim. 15th match, W 2 - D 4 - L 9 - F 10 - A 27. Slivka was cautioned in the 54th min. for Dissent, after he complained to the referee for awarding a free-kick against his team. unused substitutes: 1-Emilijus Zubas, 3-Georgas Freidgeimas, 4-Tadas Kijanskas, 5-Tomas Mikuckis, 6-Vaidotas �ilėnas, 8-Egidijus Vaitkūnas, 12-Vytautas Černiauskas, 13-Karolis Chvedukas, 17-Marius Pap�ys, 19-Lukas Spalvis, 21-Nerijus Valskis. ELO rating 9th Colours: The Nike 2016 home uniform - White v-necked jerseys with light blue sleeves and ice blue collared trim/side stripe and white cuffs, white shorts with ice blue side trim, white socks. Capt: Harry Kane, fourth captaincy Manager: Gareth Southgate, 47 (3 September 1970), appointed caretaker manager on 24 September 2016, appointed as permanent manager on 30 November 2016.
twelfth match, W 7 - D 3 - L 2 - F 21 - A 9.
unused substitutes: 12-Chris Smalling, 13-Jordan Pickford, 14-Kyle Walker, 15-Gary Cahill, 16-Eric Dier, 17-Jake Livermore, 18-Jermain Defoe, 19-Alex Oxlade-Chamberlain, 21-Raheem Sterling, 23-Fraser Forster. team notes: This is the first time England have played with a back three in a competitive match for eleven years. Harry Kane becomes the first captain to score in his first four matches. The previous record was set in 1993 by David Platt (three). With the main job done, England were looking to end their qualifying programme with a flourish in Vilnius against one of the group's minnows Lithuania. The plastic pitch on offer in Vilnius would make it a little different for the England players and during the match it was pretty obvious that it was not to everyone's liking. 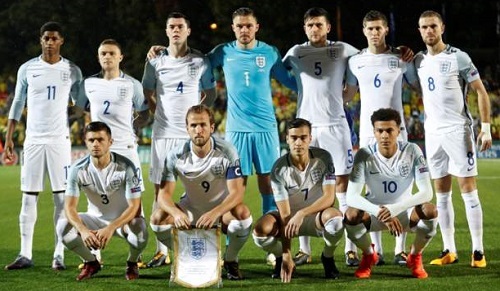 To be fair to Gareth Southgate, he was without several key players for this match and he gave first caps to Harry Maguire and to Harry Winks, and also gave a first start for Aaron Cresswell, in what was a largely experimental line-up. He also decided to go with a back three instead of a back four, and that was the first time England had done that for some considerable time. He was hoping that the central defenders could move forward to create a bit more space. In fact, England's first chance of the match came after five minutes and fell to Maguire. The Leicester City player would never have a better chance to mark his debut with a goal as a cross came in from the left, giving him a free header three yards out. Somehow Maguire sent it wide of the post and no matter how long he plays for England he will regret that moment and that golden chance. The familiar pattern of recent England games then set in, with passes across the back, square and back again being the order of most of the first half. Lithuania showed plenty of spirit and on 11 minutes Darvydas Sernas went close with a clever flick. A long shot by Ovidijus Verbikas in the 20th minute, following a corner, was easily gathered by Jack Butland, who looked assured in goal. Four minutes later another clear chance fell to England, and again it was a defender who was at the heart of the action. Cresswell's free-kick caused the Lithuania defence some problems and an attempted sliced clearance fell right to the feet of Michael Keane. The Everton defender fired in a fierce shot but the ball went the wrong side of the left-hand post. Just a minute later though, England were ahead. The ball was worked down the left and eventually found Jordan Henderson's head. He nodded it inside as Deli Alli burst through into the box. Verbikas also went for the ball and caught Alli, who went down. The referee immediately pointed to the spot and England had a penalty. Up stepped Harry Kane and the current England goal machine drilled the ball home, in off the post. Young Spurs star Winks, was having a busy, and promising, debut in midfield and he was always looking to move forward. In fact in this game there was more forward movement from England. Winks put in a good cross for Alli and Kane to go for and then Marcus Rashford burst into the box and Kane was only just beaten to his pass inside. On 38 minutes Rashford put in another penetrating run and forced Ernestas Setkus into a good save. This was England's best spell and the team as a whole was getting forward well at times. Rashford tried another burst but a strong tackle by Valdemar Borovskij stopped him, with both players needing treatment. Half-time arrived soon afterwards and although England had looked brighter at times, there was still plenty to do. After a slow start to the second-half with Sernas shooting over for Lithuania, England almost doubled their lead in the 54th minute. Cresswell, not for the first time, burst down the left and fired in a dangerous cross. Setkus pushed the ball out and it landed at Winks's feet. His first effort was blocked but the ball came back to him and he then came so close to a debut goal. A lovely side-step and a left-foot shot but Setkus made a fine save to steal the youngster's thunder away from him. It was a good moment though and Winks really looked as though he was enjoying himself on the big stage. Almost immediately, play swept up the other end and the home side so nearly equalised, and it was that man Keane again at the centre of the action. A cross came in from the right and Keane, in attempting to clear, mishit the ball and it was goalbound until a brilliant save by Butland spared the Everton man's blushes. The goalkeeper had had very little to do but that moment certainly showed his powers of concentration, it was a fine save. Sernas again shot over with another effort and then Alli did likewise at the other end. The 1-0 scoreline was by no means safe and England had to be alert to the swift counter attack. But it was England who came closest a few minutes later as a fine cross by Henderson to the far post was met by a towering header by Cresswell. The ball also seemed goalbound but somehow Setkus managed to claw the ball away from the top corner with a flying save. Kane then shot wide before Daniel Sturridge came on for the impressive Rashford. The United youngster had had two excellent games and he can be very pleased with his contribution in this International break. For the final ten minutes England kept control with Sturridge looking lively and then another substitute Jesse Lingard joined the fray, and also showed up well in the short time he was on. However, in the 85th minute Lithuania missed a golden chance to equalise. The ball was headed on and Deivydas Matulevicius chested it down and it sat up perfectly for him. But instead of aiming for the far post he shot straight at Butland and the goalkeeper made a comfortable save. It was a bad miss and also highlighted the brittleness of the England defence at times. The match ended as it had begun with Maguire missing a great chance. A cross came in from the right and Maguire was not positive enough at the far post to fire home. He should have scored, as he should earlier, and he must be kicking himself for not having a goal to celebrate his England debut. So, another qualifying group negotiated, another victory, another clean sheet, lots of good individual performances, another Harry Kane goal and yet, lots to work on for Gareth Southgate. It is not all doom and gloom as some would have us believe, Wales and Scotland would love to be in our position, but there is no doubt our performance levels must be lifted before next summer. Our next two games, friendlies against Germany and Brazil might just give us a bit more of a test. One thing is for certain, everybody must be on their best form for those two star attractions. Come On England! !